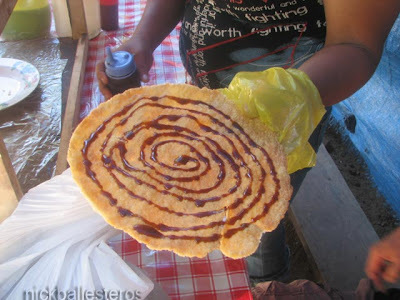 As we alighted the rented jeepney we rented for the day at Camiguin Island, I saw this stand which was selling this crunchy, lumpia-wrapper-like thing that resembled a huge plate. Wanting to try something local, I bought one. Can't remember anymore how much it costs... but when it was taken from the covered display stand, the vendor started squirting sweet, chocolatey stuff on it in a whirl, then handed it to me. I snapped off a small portion and nibbled on it. Crunchy and sweet! Having consumed it a few minutes later, we went off happily to the waterfalls. What I like from Camiguin is their Pastillas. Ang sweet ng filling. BTW, I added you to my blogroll. Chef Queer: Oh yes! How come I forgot about that? The bread with the sweet filling! What was that again? I should post about it too. Ah, the pastel! Thanks for adding me to your blogroll! Will reciprocate. Ah! that thin disc like delicacy is called "Kiping". We were at Katibawasan Falls and they were selling it at the entrance. It's made of cassava and latik.